Just like it looks in the picture. Order an XL I take a size 14. Glad I didn't go with the LG. 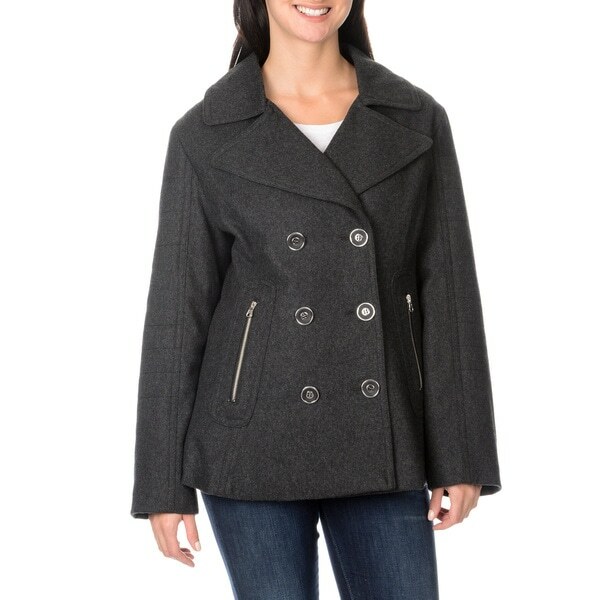 Ladies wool fashion peacoat with silver accents, zipper pockets,double breasted. Finished in black, charcoal or red to match anysophisticated attire. Not pleased with jacket at all. I do not like the cheap quality looking jacket at all. I just don't want to go through the process of sending my jacket back. I will just donate it to somebody. just received this jacket and I love it terrific quality and the lining is very nice. I love this jacket very nice, didn't get to wear it yet, hopefully this winter in texas. I love the look of this peacoat and the color is nice , hope I don't have to return it.